Antigone in Ferguson's title is little misleading. In its first section, Bryan Doerries’s Theater of War production is not actually far different from Sophocles’ original tragedy. Its story of Thebes, torn apart by the conflicting claims of authority and conscience, still has all its ancient Greek trappings, and any association you make with certain events near St. Louis is, it seems, up to you. Doerries has given the cast—a rotating rep of fine film, theater and television actors (such as Frankie Faison, Tate Donovan, Samira Wiley and Paul Giamatti)—a trim hour-long version, and they perform it sitting at music stands, reading from scripts. Behind them a tip-top band and a choir full of gospel powerhouses sings Phil Woodmore’s wonderful settings of Sophocles’ famous choruses. No one tells us that the dead boy Polyneices could also be called Michael Brown; no one hints that Antigone—his sister, who buries his body in defiance of her uncle King Creon—could be a Black Lives Matters protestor. How, you wonder, did they get that title? All is revealed in the crucial second half of the show, a panel and guided discussion. 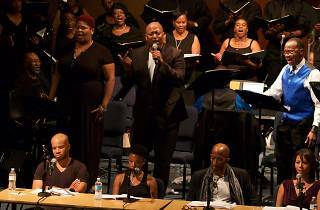 The members of the chorus begin to reveal their “actual” identities; the connections to Ferguson grow and multiply. When I saw it, the chorus contained young and old, white and black, police detective and educator. One man told us that he had taught Brown himself, and he spoke movingly about the way he feels Brown’s blood covers and sanctifies his performance. What almost never happens in postshow discussions starts to happen: The conversation retroactively infuses the reading we’ve just seen with more meaning, import and complexity. 2500 years ago, the first democracy thought theater was a crucial dimension of citizenship itself. 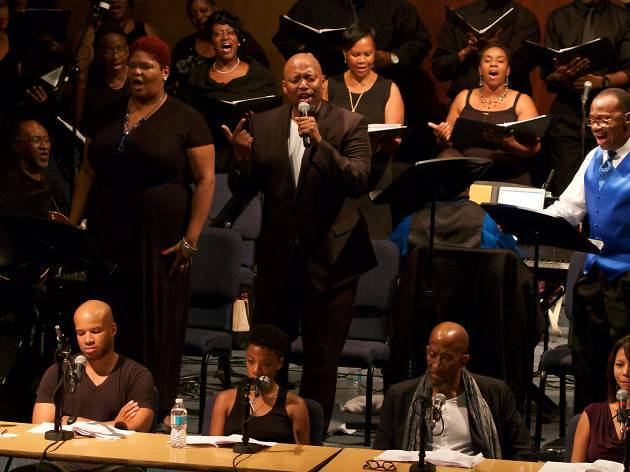 Antigone in Ferguson reveals and revives that purpose. Everything ancient is new again. Harlem Stage (Off Broadway). By Sophocles. Adapted by Bryan Doerries. Music by Phil Woodmore. Running time: 2 hours. One intermission.